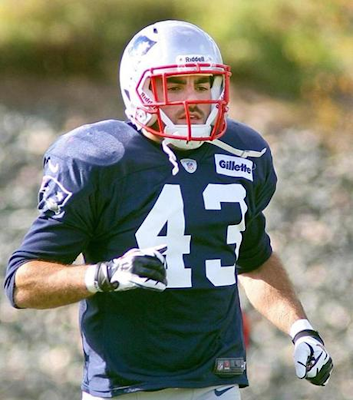 Nate Ebner (left) had a nose for the ball on both the rugby and football fields while at Ohio State. There are no plastic hats in rugby, where the leather scrum cap is a 19th-century vestige. Until Ebner walked into the Ohio State locker room in 2009, he’d been a fly half for Uncle Sam’s junior team and for the Buckeye club squad. Suddenly he had a facemask, a playbook, and a new job description. Safety Nate Ebner’s work on special teams at Ohio State caught the eyes of the Patriots. Once he enrolled at OSU, Ebner knew that his international rugby days were over, at least if he wanted to earn a degree within a normal time frame. “That restraint left me just to play with the club team,” he said. “With the drop-off there I was just looking for something more. I was craving something.” He’d talked to his father about walking on for football. “Any kid growing up in Columbus would want to be part of something like that,” he said. What made up Ebner’s mind was his father’s death in the wake of a robbery that November at the family’s auto salvage business, where Jeff was brutally beaten to death. (His killer is serving a term of 15 years to life.) Football, with its demanding daily routines, proved to be a therapeutic way for his son to channel his emotions. But after a tough loss to Purdue that fall, it was the walk-on rugger who stood up in the locker room and told his teammates about his father’s motto: “Finish Strong,” and urged them to crank it up. The Buckeyes, sporting “Finish Strong” wristbands, won their final six games, taking the Big Ten title and beating Oregon in the Rose Bowl. Ebner eventually earned a scholarship, based strictly on his special teams skills, as well as a couple of nicknames — “Leonidas” for his beard and heroic work ethic and “War Daddy.” Yet while he was used sparingly on defense, he attracted interest from NFL clubs after his Pro Day campus workout raised NFL eyebrows. Ebner had speed, size (6 feet, 210 pounds), and the versatility that comes from playing a game where everyone has to run, tackle, and kick. Who knew that Ebner already would have logged more defensive plays in two months as a Patriot than he did in three years as a Buckeye? A smaller roster means more opportunities, wherever they may pop up. “That’s what you’re here to do,” Ebner said. “You’ve got to be prepared for those type of things. You’ve just got to be ready for when the time comes.” If the time ever comes when Belichick needs someone to put a dropkick through the uprights from 30 yards out at an acute angle, Ebner’s his man. He’s been there, done that — and without a plastic hat.